Whether you make your own crust or buy a premade graham crust, this is easy to make and kids will enjoy helping! Place Graham crackers in ziplock and smash until fine. We used a mohito stick but you can even use little hands to help. Mix crumbs, butter and granulated sugar. Press firmly into bottom of pie pan. Gently stir in whipped topping. Spoon over crust and refrigerate at least 1 hour or overnight. Press cookie cutters lightly into top of the cheesecake. Warm jam in microwave just until it is easy to spread. It took only about 10 seconds. Using small spatula, spread jam up to all edges of the cookie cutters. Chill a minimum of three hours or overnight. 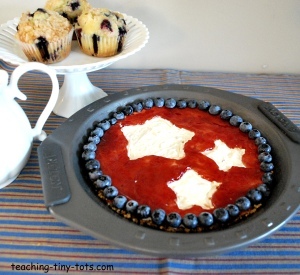 Carefully remove cookie cutters and arrange blueberries around the edge of the pie pan. Add single or double rows. Cover carefully and refrigerate until ready to eat. Leftovers must be refrigerated. Premade graham crust will speed up things even more! A metal cutter with no lip would have been much easier to spread the jam up to the edges to get a sharper image. Our blue cutters had a lip on the top which made it difficult to get the jam up to the edges. If you want extra stars, be sure to keep jam from an area to make another star. We used only two sized cutters. 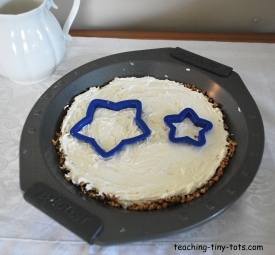 Simple shapes work best for this toddler recipe. The girls absolutely loved it as did I. My husband thought the whipped topping should be reduced and cream cheese increased so I will try that the next time and will post any changes we try for others to try as well! Thanks for stopping by! Comments Are Welcome!